Five movies into what is sure to be a long and prosperous filmography, Edgar Wright may have already made his masterpiece – or at the very least made something so exhilarating and phenomenally put together that it will be hard for him to top it for a long while. Baby Driver, an original concept from the director of the Cornetto Trilogy, Scott Pilgrim vs The World, and almost Ant-Man before departing and handing the reins over to Peyton Reed, has been floating around Wright’s head for years, even forming the basis for a music video he directed in 2003 for Mint Royale’s “Blue Song” (watch it below!). That music video inspires the film’s opening scene, which similarly sees Ansel Elgort’s Baby, a talented young getaway driver, rock out to some music – in this case, Jon Spencer Blues Explosion’s “Bellbottoms” – while a group of criminals, including Buddy (Jon Hamm), Darling (Eiza González) and Griff (a cameoing Jon Bernthal), rob a nearby bank. As we later find out, Baby is working for crime kingpin Doc (Kevin Spacey), paying off a debt he incurred when he was younger by acting as a getaway driver for a mix-n-match group of criminals throughout the city of Atlanta – Baby’s USP, however, is that he drives and acts in sync with the music he’s listening to on his iPod, which he constantly has playing on his earphones to drown out the tinnitus he received from a car accident when he was a kid. Talented though he may be at the job, Baby seeks a life away from the world of crime, and sees his chance to escape when he meets beautiful waitress Debora (Lily James) and slowly falls for her… but first, he must carefully try to not get on the wrong side of the criminals he’s working for, including the dangerously unhinged Bats (Jamie Foxx). When you break it down it’s the standard “young criminal is roped into one last job before he’s off scot free” plot seen in most crime-action movies, but Wright’s direction and script is so beautifully customised and bursting with life at every corner that it really doesn’t matter. The way that Wright incorporates music into the film is a truly outstanding achievement, as not only is it packed with several deep-cut tracks from artists like Queen, The Beach Boys, Simon and Garfunkel, T. Rex and many others, but he handcrafts everything from the choreography of the breath-taking car chases to sound effects like gunfire and car horns to fit around the very beats of those songs. The opening credits sequence alone is a masterclass in how to perfectly blend music and movement together, with everything syncing beautifully to Bob & Earl’s “Harlem Shuffle” whether it be carefully placed graffiti in the foreground or people talking on their phones in the background. It’s a fantastic piece of filmmaking all around, made by someone who very clearly loves the medium of film and also has one hell of an awesome taste in music to go along with it. Though this is Wright’s most mainstream film to date, his trademark style and kinetic sense of energy is felt all throughout this film, from the blink-and-you’ll-miss-it moments of humour that all but guarantees repeat viewings, to the quick-cuts in the editing that only last seconds yet you can still make out what the hell is going on. 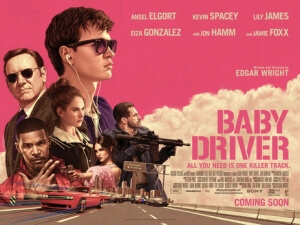 Wright has experimented with these kinds of editing and fast-paced action beats before in films like Hot Fuzz and Scott Pilgrim, but Baby Driver is where he perfects them, making every scene feel like a rush even when it isn’t an action scene, and having them contain things that will always keep people’s attention, whether it’s in the foreground or background. It’s fun to watch Wright use his trademark style introduced in Shaun of the Dead in this much more contemporary Americana setting, and with these highly-acclaimed and award-winning actors, including Oscar-winners Spacey and Foxx who are just having a hell of a lot of fun in their respective roles, and Jon Hamm who has honestly never been more terrifying in a major theatrical release. But this is Ansel Elgort’s show, and don’t let his pretty-boy looks or the fact that he was in The Fault In Our Stars put you off, because he is a true natural when it comes to on-screen charisma, quiet intimidation, and endless amounts of physical acting that must have left him feeling more breathless than an asthmatic Olympic runner. He shares great chemistry with Lily James, and really makes you root for his ultimate redemption and his formal escape from this dangerous criminal underworld. There’s seriously no other film like this that’s out at the moment, and I have a sneaking suspicion that this will be carefully studied by future action filmmakers on how to expertly choreograph and plot a movie of this genre, alongside Mad Max: Fury Road which this would make one hell of a double-feature with. With its endless amount of exhilarating action and intelligent filmmaking, you’d be hard-pressed to find a more impressive film than Baby Driver, easily one of the year’s best. Baby Driver is an exhilarating and expertly-crafted action movie that represents writer-director Edgar Wright at the top of his game, combining his trademark kinetic style with a great ensemble cast and a fantastic soundtrack that he inspiringly customises most of the movie towards, resulting in a breath-taking and endlessly enjoyable movie that counts as not only one of the year’s best, but maybe one of the best films of its genre this decade.